This is a great paper piecing project that can be made any size; the pieced blocks are 6" square with a mini border added that makes then 8" square. The designer used a checkerboard border; I opted to use a black and white print fabric. This could be a great small wall hanging with only 3 or 4 cups, create a Mug Rug, or you could make great pot holders with only 1 cup! 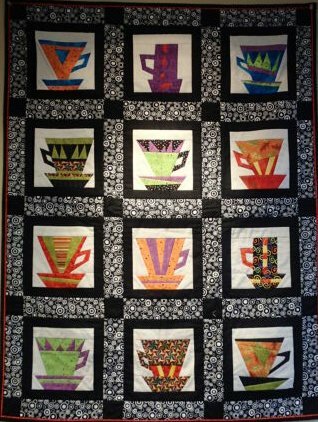 These are great gifts for your coffee drinking and/or quilting friends. This is a great project to learn paper piecing or if you already know how you’ll be able to get a long way toward having a small wall hanging after the class.